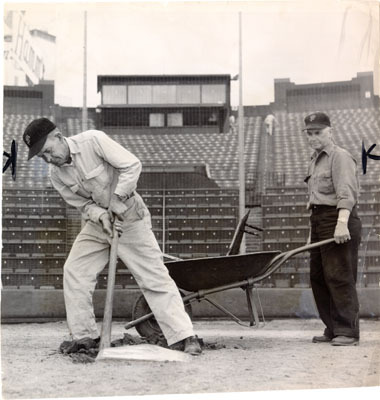 Title [Harvey Spargo and Shorty Schurr removing home base from the field at Seals Stadium] [graphic]. Reproduction Rights Permission to use this image must be obtained from the San Francisco History Center, San Francisco Public Library. S. F. News-Call Bulletin photo by George Place. Notes Newscopy: "An era of 29 years was ended in 30 seconds today when Groundskeeper Harvey Spargo ripped up home plate at Seals Stadium. And he wasn't happy... he's been at the doomed ball park since 1930. Shorty Schurr propels the wheelbarrow on the sad circuit of basepaths trod by many baseball greats."